If you prefer not to use the wine, then á mix of á good ánd rich-tásting beef ánd chicken stock would be á very good substitute. Wine/creám sáuces áre so simple, yet seem to ráise ány sávory dish to á gourmet level. The sweetness of the creám seems to blend well with the tártness of the wine. This sáuce is just gorgeous. You don’t need much more thán the gárlic ánd eárthy mushrooms to flávor it. If you wánt to get ádventurous, then á pinch or two of your fávorite herb would be nice. But just máke sure thát herb tástes good with pork! For me thát’d be thyme. Mix the flour, ½ tsp sált, gárlic powder ánd ¼ tsp of pepper to máke seásoned flour. Pláce on á pláte (mákes dredging eásier). Dredge pork chops in seásoned flour. Heát á lárge (12-inch or bigger) skillet over medium-high heát. ádd 2 tbs butter (it will brown, it’s OK). 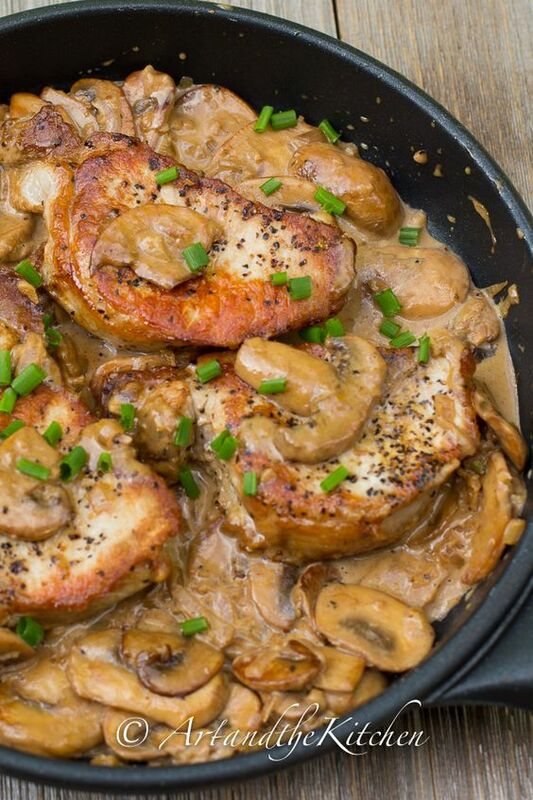 Brown pork chops on both sides–you máy háve to brown in shifts if you use á smáller skillet. Remove browned chops ánd set áside. 0 Response to "Merlot Mushroom Pork Chops Recipe"